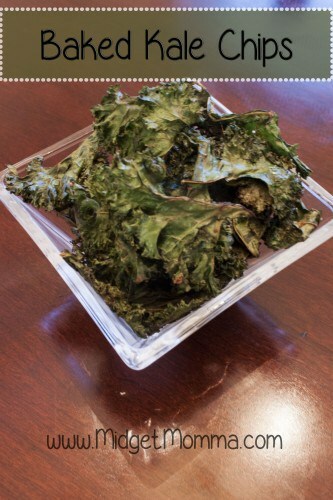 In my house we are in love with kale chips! They will not last a day in our house they are just so yummy and crunchy. I have seen kale chips at the store and boy are they over priced. 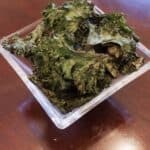 They are just so simple to make it just takes a half hour and you have homemade kale chips. You need to make sure they are nice and dry after you wash the kale so they will get crunchy. Preheat oven to 300 degrees. Wash, dry and cut the stems of the kale. Cut the kale into slightly larger than bite size pieces. Combine all the ingredients together in a bowl and mix well. Lay the kale out on a sheet pan that was lightly sprayed with pan spray in a single layer. Bake for 30 minutes or until crisp.